This page of the CarbaCap website is dedicated in helping customers resolve most common issues. Look over our frequently asked questions. We also recommend thoroughly reviewing the instructions. Most of the problems arise from deviation of the standard instructions. If you still have issues please feel free to contact us. 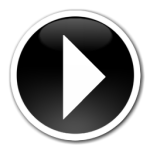 We are in the process of adding a standard instructional video and we will post it here soon. You can send us a email regarding warranty or any other issues to info@CarbaCap.com. Click on the question below that is closest to your issue you are having. Your browser should display the answer to your question. My CarbaCap seems to go on crooked for some reason? Quick Answer: Not using a standard PET bottle will make the CarbaCap appear to thread on crooked. CarbaCap is designed to use standard PET bottles. For additional information on this issue, review the long answer below. Photo off of the retail packaging. The CarbaCap is specifically designed to fit the most commonly available standard PET bottles. There is a great deal of confusion within the consumer market of what a standard PET bottle is. All PET bottles start off as a molded preform. This preform is made and shipped to the bottling company where it’s reshaped into a useable PET bottle. The threaded area on the preform never changes in this reshaping process. 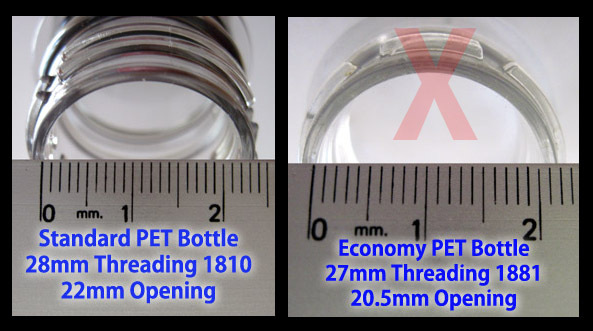 The industry has defined a standard PET bottle to be made from the common 1810 preform with 28mm OD threading or the 1881 preform with 27mm OD threading. Both of these standard PET bottle preforms have a 22mm ID opening. This is the most common standard carbonated beverage PET preform shape and container in the world for over the past three decades. With over 8 billion in production annually. There are many other preform PET bottle shapes. The non-standard preform 3025 and 2925 are meant for the non-carbonated water, sports drinks and juice market. These non-standard PET bottles are not meant for holding pressurized liquids and therefore use less plastic in the preform. CarbaCap users should avoid attempting to use this type of non-standard PET bottle. Recently a variation of the 1881 preform has been introduced to the market as an economy PET bottle. This economy preform has a slightly smaller 20.5mm opening and shorter neck area to decrease shipping weight. Although the threaded portion of the CarbaCap fits the economy 1881 preform, the gas retaining wall (GRW) inside the CarbaCap cannot seat properly within the smaller opening. Over time this will damage the CarbaCaps GRW and will cause failure. Users may attempt to over-tighten the CarbaCap to force the GRW to fit in this small opening. Either the CarbaCap or the non-standard/economy PET bottle will fail to obtain a gas-tight seal. Do not attempt to use non-standard or economy PET bottles with the CarbaCap. Refer to the photographs below to help ascertain the identity of the PET bottle preform threading. Only standard PET bottles (preform 1810 or 1881 threading) with a 22mm opening are standard PET bottles. 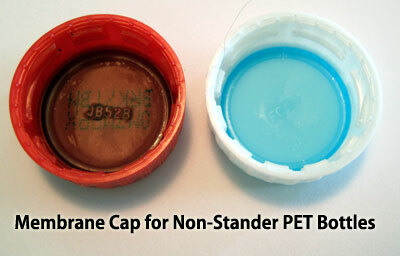 Manufacturers who choose to use the economy or non-standard PET bottle are required to use a membrane cap. 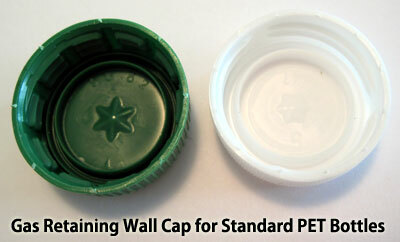 By looking at the original cap you can quickly determine whether or not you are intending to use a standard PET bottle. Standard PET bottles use a cap with a gas retaining wall (GRW) built in. Please refer to the following photographs for more details. Manufacturing Note: The CarbaCap is injected molded around a negative solid-state threaded pin. This ensures that the threading is absolutely consistent with every single molded part. It would be impossible for a "defective" thread part to be made in this process. Also every handmade CarbaCap goes through a thorough inspection and Hydro Testing before packaging. It is physically possible to force a misalignment of the threading with the pressure relief grooves in the threading of the standard PCO 1810 or 1881, PET bottle. Although this takes considerable physical force, it is possible. If you are using the standard PCO 1810 or 1881, PET bottle and the CarbaCap is not seating correctly. Please follow the capping procedure below. Place the CarbaCap on top of the PET bottle threading. Lightly press down on the CarbaCap body and turn it counterclockwise. Listening closely for a slight click. This sound and thump feeling is the first threading matching the reciprocal threading. The cap will also move down towards the PET bottle threats slightly. Slowly and evenly turned the CarbaCap clockwise keeping the cap level. Keep in mind that the standard PCO 1810 or 1881 PET bottle threading has pressure relief grooves that could allow the threading to become misaligned. Furthermore forcing a misalignment of the threads can alter the interior of threading of the CarbaCap over time and rendering it incapable of seating correctly. We recommend trying to procedures above to prevent this from occurring. If the threading on the CarbaCap is damaged please send it to us for warranty replacement. My injector will not lock down on the CarbaCap anymore? Quick Answer: Some injectors will cause damage to the CarbaCap. There is no need to lock down the CarbaCap when using it properly. Refer to instructions. 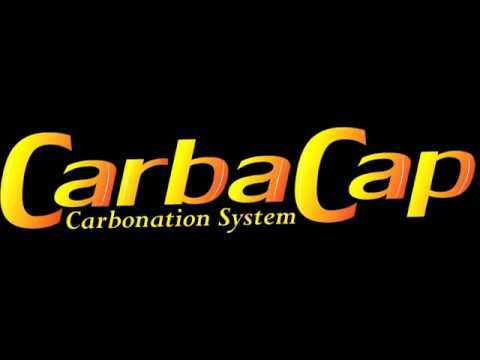 Many CarbaCap users do not follow the directions which states that they should remove the injector before shaking. Leaving the injector locked down on the CarbaCap during the shaking process will cause the ball bearings on the injector to wear away the locking ridge on the CarbaCap over time. There are two critical reasons to not leave your injector connected to a CarbaCap. Sanitation - It's not necessary to have the injector locked down on the CarbaCap. Please refer to the instructions card and here on our website. Leaving the injector connected will cause liquids and averages to flow freely into the injector and up the CO2 hose. This liquid and moisture (water) is a perfect breeding ground for bacteria and mold. Many homebrewer's mistakenly believe that the CO2 will keep this from occurring. There are numerous harmful bacteria's and mold who prefer a CO2 enriched environment to grow. If this has occurred you will need to either replace the equipment or meticulously take apart sanitize and clean it before you can use it again. If the injector is rusted, dirty or sticky the ball bearings in the locking mechanism will stay engaged. This will cause scrapes, gouges and cuts on the CarbaCap when forcing the injector down onto the cap. Also, if the user does not pull up on the locking ring while inserting the CarbaCap this could increase damage. If you feel that you have worn out or damaged your CarbaCap by not following the instructions or not using your injector correctly, please send your CarbaCap to us for warranty replacement. Is there a missing O-ring inside just pass the threaded area of the CarbaCap? Quick Answer: The CarbaCap is specifically designed not to need an internal O-Ring. We do not recommend installing one as it will damage the CarbaCap. The CarbaCap has only two O-ring's. The first O-ring is on the metal pin inside the cap. This O-ring is compressed against the inside of the cap by a spring. This remains closed until pushed inward by the injector. The second O-ring is on the outside of the cap and maintains a tight seal between the injector and the cap. Many CarbaCap users think there should be an additional O-ring where the PET bottle threads onto the cap. 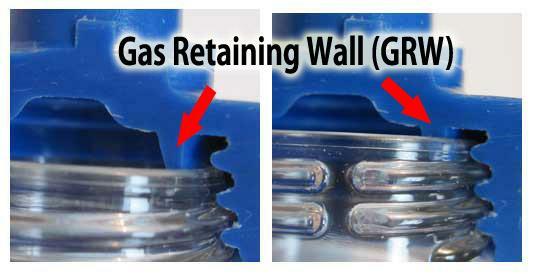 There is a special ridge inside the cap called the Gas Retaining Wall (GRW). This part of the cap extends directly inside the PET bottle sealing it with a cap without the need for an O-ring. It is not recommended to add an additional O-ring in this area. If an off market O-ring is placed in this area there are two major factors to consider. (1) Most O-ring need a space to expand when compressed. This would crack or damage the Gas Retaining Wall inside the CarbaCap. (2) The additional O-ring would prevent the cap from safely off venting pressure when uncapping. This could cause the CarbaCap to become an unsafe projectile. As the CarbaCap is not designed to accommodate an O-ring in this area it would be detrimental and counterproductive. The Gas Retaining Wall on the CarbaCap should be sufficient for standard use. Will I need additional equipment to use the CarbaCap? Quick Answer: The CarbaCap is part of a carbonating system. You will need additional equipment from your supplier. Yes, you will need a complete carbonating system that will contain the following parts. We recommend that you work with your retailer to get the proper equipment. There may be suitable substitutions or upgrades available. Always remember to follow the instructions on the back of the CarbaCap retail card or here on this website. My CarbaCap is making a lot of hissing noise? Quick Answer: All CarbaCaps are tested before packaging. New users may be using incompatible PET bottles. CarbaCaps have a lifetime replacement warranty. Each CarbaCap is made by hand, multiple inspections and fully hydro tested before packaging. It is highly unlikely that the CarbaCap is defective new out of the package. If you are hearing a loud hissing noise it may be material has formed within the unit. Proper cleaning should be maintained to prevent this issue. Also check the threads on your PET bottle as they may become worn or cracked over time. Always use the proper standard soda PET bottle with the CarbaCap. If your CarbaCap is unusable please send it back to us and we will replace it. Click the link marked warranty on this website for more information. Can I use a black liquid out connector with the CarbaCap? Quick Answer: No, the CarbaCap is specifically designed for the Cornelius style gray gas injector. The black liquid coupler is intentionally too small. The Cornelius coupler system is intentionally sized differently and color coded. The gray gas couplers (in) are larger than the black liquid couplers (out). This was to prevent users from accidental crisscrossing of liquid and gas. The CarbaCap is larger than the smaller black liquid coupler can accommodate. 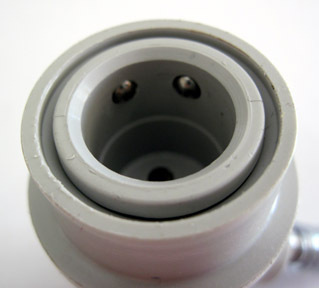 As the CarbaCap was specifically designed for CO2 gas it is sized for the slightly larger gray connector. We have had reports of users intentionally forcing a black liquid connector onto the CarbaCap. It is an extremely tight fit and is difficult to separate. We don't recommend using the liquid connector because of the sizing differential. Are there BPA-Free containers available for use with the CarbaCap? Quick Answer: PET bottles do not contain BPA. You must use a standard PET bottle with the CarbaCap. The CarbaCap recommends that you use standard PET or PETE (polyethylene terephthalate) bottles. This is commonly available filled with charged water or soft drinks. It is also available in many sizes but most commonly in 1 to 2 liter size. Regardless all PET bottles are free from BPA (Bisphenol-A) effects. Ralph Vasami, executive director of the PET Resin Association (PETRA) explained in a recent press release. "Unfortunately many consumers and media reports have confused polycarbonate with polyethylene terephthalate, which is PET. We want the public to know that PET doesn't contain any BPA and never has." My ball-lock injector will not pass gas through the CarbaCap? Quick Answer: This can occur by using excessive CO2 pressure. The issue could also be related to other equipment malfunction. There are many types of ball-lock gas couplers (gray or white) on the market today. The CarbaCap is designed to work with the most common and standard type of ball-lock couplers. The CarbaCap is handmade and thoroughly hydro tested with a standard ball-lock coupler using a standard PET bottle blank before leaving the factory. This hands-on quality assurance helps make the CarbaCap reliable for use. Although highly unlikely to have failure "out of the box" we recommend that you perform the following test. To determine whether the coupler or the CarbaCap is at fault a simple test can be performed. Attach the coupler to the CarbaCap without anything attached (PET bottle, gas lines, etc.). Gently blow air into the bottom of the CarbaCap. Notice if air passes freely through the CarbaCap and exits coupler's hose connection. If you've noticed that air is passing through the CarbaCap and coupler, the equipment is working properly. If no gas passes from the CarbaCap through the coupler then there is an issue with the coupler valve stem. This could be caused by three known issues. Issue #1: The valve stem of the coupler is not long enough to properly engage the CarbaCap's pen in spring system opening gas flow. This type of coupler also has difficulties in connecting with standard Cornelius keg ball lock systems. Issue #2: The valve stem and spring are jammed closed. Keeping the internals of this coupler clean is essential for the valve stem to move properly. Couplers are easily disassembled for cleaning by the top relief screw. A simple cleaning of the valve stem and spring could solve the issue. Issue #3: The operating inbound gas pressure in addition to the valve stem spring pressure is higher than the spring pressure on the CarbaCap. The CarbaCap's pen and spring are specifically designed for a standard amount pressure. Exceeding the operating pressure on inbound gas can cause the coupler (not the CarbaCap) to seize-closed, requiring additional excess pressure to open on the couplers valve stem. Decreasing the inbound pressure will allow the coupler to open naturally. If you determine that the failure is the CarbaCap itself, it is under replacement warranty. Follow the link for details on warranty issues. We also recommend a thorough read through of the instruction sheet. It has been our experience that this will solve most problems. What type of soda bottle is best to use with the CarbaCap? Quick Answer: Any standard PET bottle that is intended for carbonated beverages will work with the CarbaCap. For safety, never use glass bottles. The CarbaCap threads are specifically designed for the standard soda PET bottle. PET bottle preforms (blanks) are molded with specific standard threads. The preforms are sold in bulk to companies that heat the bottom of the preform and inflate them into 1 or 2 liter bottle shapes. This can be made many different shapes and colors however the PET bottle preform threading is the same. The CarbaCap should fit tightly and snug on any standard soda PET bottle threading. Also remember to replace/recycle the PET bottle often as they can be come worn and unsuitable. Here is a list of containers that the CarbaCap will not work on or should not be used on. Glass Bottles of Any Kind! The threading on the CarbaCap will accommodate any of the PCO 1810 (28mm) or 1881 (27mm) PET preform bottle threading with a 22mm opening. This is the industry's standard soda PET bottle threading sizing. CarbaCap will fit over 8 billion standard soda PET bottles from almost every country in the world. We are constantly asked about water bottles compatibility. Only water bottles using the standard PCO 1810 (28mm) or 1881 (27mm) threading with a 22mm opening will work. A quick way to check is to look at the threading on the bottle. If the threading does not have pressure relief grooves/trenches, it is not recommended. Use of this type of bottle will cause the cap to off gas incorrectly and will potentially make it a projectile during uncapping. Also, if the bottle did not have a carbonated beverage in it originally, don't use it for carbonated beverages now. Most water/juice/un-carbonated beverages use the PCO 3025 or 2925 threading on their containers. Because the beverage is not carbonated there is no need for grooves/trenching on the threads and the bottle can accommodate cheaper caps. Does the carbon dioxide (CO2) need to be kept cold as well? Quick Answer: CO2 doesn’t require refrigeration. Depending on your setup it is OK to use cold CO2, but not required. The CO2 gas under pressure requires no refrigeration. Small quantities of CO2 under pressure remain as a liquid at room temperature. Larger CO2 containers need recycling systems to temporarily heat up the CO2 to keep it from forming into a solid. You may notice that when the cylinder loses pressure it will start to get very cold. CO2 gas is cryogenic in that when it gits to normal atmospheric pressure its molecules contract momentarily getting very cold. This solid is also known as dry ice. This temporary cold state is colder than any standard refrigerator or freezer can get. Regardless for home carbonting use it is not required or recommended that you refrigerate the CO2. It is okay to leave the CO2 cylinder inside the refrigerated container such as a keg system. 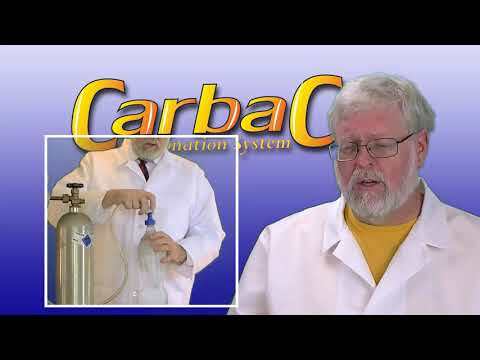 Are the CarbaCap and the Carbonater the exact same product? Quick Answer: The CarbaCap is based on similar technology, however, it’s significantly improved. We do not warranty other people’s products. The answer to this question is complicated. The Carbonater™ was made under the company Liquid Bread® Inc. The CarbaCap® is made under the company S Richards, LLC. The owners of S Richards, LLC were contracted in 2003 by Liquid Bread® Inc. to produce, assemble and fill orders for the Carbonater™. Liquid Bread® Inc. consistently operated at a loss. In 2014, when it was clear the debts Liquid Bread® had sustained would never be cleared, its assets had to be liquidated and distributed back to the only remaining debtor (S Richards, LLC). S Richards LLC paid debts owed on the Carbonater™ mold and for its refurbishment. For over a year, as a courtesy to Carbonater™ users, CarbaCap® honored the Carbonater's warranty. CarbaCaps® sold today are made from that mold BUT use a new space-age plastic called K-Resin® which ensures a "Gütentite" seal and longer life than the Carbonater™. There is a new customized stainless steel pin and "Goldilocks" spring, neither of which were in produced for the Carbonater™. Additionally, CarbaCap® is backed by the many years of experience from the same commercial and home carbonation expert, Stan Richards, that Liquid Bread® Inc. had. It is also important to note that Stan was one of the founding inventors of the Carbonater™. There is no one more expert for assistance with the CarbaCap®! S Richards, LLC is no longer able to service their Carbonater™. 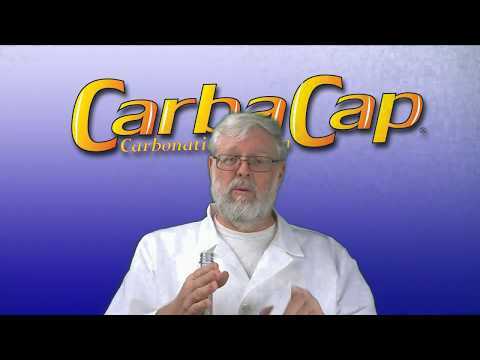 This is to support the distinction between the new CarbaCap® and the old Carbonater™. My retailer doesn't sell CarbaCap. How do I get one? Quick Answer: Ask your retailer to contact us or look online for a CarbaCap dealer/retailer. As the manufacturer we do not sell directly to the public. However we have many wholesale and retail outlets throughout the world. We recommend asking your retailer to stock the product you wish to buy. If they don't, the Internet will provide you with many opportunities to purchase the CarbaCap. I have noticed small indentations or grooves on the top of my CarbaCap? Quick Answer: All the equipment should be regularly cleaned and maintenance to prevent malfunction. This damage is caused from not retracting the ball bearings in the injector coupler or the ball bearings are jammed. A thorough cleaning of the injector coupler will ensure that the ball bearings can move out of the way when being used. Also remember to pull up on the injector coupler ring to disengage the ball bearings before placing it on top of the CarbaCap for injection. Minor scratches and grooves from not properly using the injector coupler are common. This should not affect the CarbaCaps primary function. However over time this could cause the top of the CarbaCap to crack and release pressure. 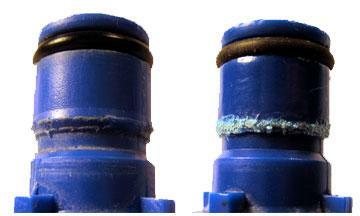 Proper care should be given to using your clean injector coupler properly. Additionally there is no need to lock down the injector coupler on to the CarbaCap. CO2 can pass quickly into the standard PET bottle while holding up the lockdown ring. Always remove your injector coupler from the CarbaCap before vigorously shaking the container. This will prevent backwash into the injector coupler. A strict adherence to the instructions that came with your CarbaCap is recommended. A part has protruded from the bottom of my CarbaCap? 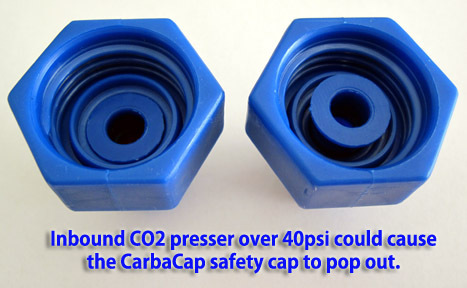 Quick Answer: Using CO2 over 40 psi will cause the safety plug to disable the CarbaCap. Higher CO2 pressure will not create more carbonation. The CarbaCap is specifically designed to fail if the inbound pressure exceeds 40psi. This is known as the safety cap. Exceeding this maximum pressure is common when users insist on using excess amounts of pressure. More inbound pressure does not give your beverage more CO2. Only injecting CO2 at normal operating pressure and agitating the CO2 into solution will give you more carbonation. This safety cap is to prevent users from intentionally over pressurizing containers to an unsafe level. Containers that are over pressurized can explode. We strongly recommend that you follow the instructions that came with your CarbaCap for your safety and others. Is the CarbaCap dishwasher safe? Quick Answer: The CarbaCap is home dishwasher safe (top rack). Yes, we have thoroughly tested the CarbaCap in home dishwashers and have found them to be completely safe. This method is efficient at cleaning and sanitizing the unit. We do recommend placing it on the top shelf and using liquid detergent. This seems to yield the best results. What is the difference between a the metal cap and CarbaCap? Quick Answer: With no safety release valve of any kind, the metal caps are extremely unsafe for use in the home. The carbonating metal cap on the market is nothing more than a steel fitting that accommodates the standard metal Cornelius keg gas connection to a compatible threading of PET bottles. There is a significant difference between the CarbaCap and this metal variation. Built in safety release cap to prevent dangerous over pressurization. Hexagon form factor for better grip on tightening and uncapping. Manufacturer’s support and customer service. Completely manufactured in the United States by Americans. Custom-made surgical stainless steel interior pin for sanitary use. K-Resin® body for sanitary food grade usage. Stainless steel “Goldilocks” spring to maintain proper pin pressure. Limited possible leak points designed. Nonmetal contact with PET bottle threading to decrease stress and wear. Over 20 years experience in the home beverage carbonation market. In our laboratory testing we have found that this metal fitting is unstable. Even though it is sold as a "stainless" steel device it is quite ferrous and a metal that’s highly magnetic. The iron content of the metal being high is indicative of Asian steel manufacturing. This fitting rusts easily if not kept completely dry at all times. There are variations that have been chromed or plated. However over time this coating will flake off and expose the ferrous metal underneath. With no safety release valve or safety device of any kind this metal fitting would be extremely unsafe for use in the home. It would be easy to accidentally over pressurize a PET bottle causing it to explode. Uncapping an over pressurize PET bottle with a smooth round bullet shaped metal cap would be extremely dangerous as it could easily become a projectile. As the metal cap version tends to be higher priced there is no real cost savings. The assumption of metal lasting longer than plastic is equaled out by the replacement guarantee of the CarbaCap. We do not recommend the metal cap for the following reasons. The metal cap has no design safety features making it extremely dangerous to use. There is no manufacturing support for the metal caps on the market. All metals with iron content will rust. No price difference or savings. Longevity of metal is nullified by replacement guarantee of the CarbaCap. Is there a CarbaCap that fits growlers? Quick Answer: The CarbaCap is specifically designed to fit standard PET bottle which can be used for repackaging and transporting beer like a perfect growler. The CarbaCap fits only standard PET bottle threading with an opening of 22 mm. Most growlers sold on the market are glass and will not fit a CarbaCap. We do not recommend attempting to use the CarbaCap on any glass container. The standard PET bottle is a perfect container for use in the repackaging of gourmet micro brews. The instruction card that came with the CarbaCap has a section “To Repackage Beer or Growler:” with a few changes listed in the instructions you can successfully fill and transport beer using a standard PET bottle as a growler. PET bottles are more flexible and will maintain the carbonation longer when using the CarbaCap carbonation system over a standard growler. Many microbreweries and taprooms are starting to move into using the standard PET bottles with the CarbaCap and replacing fragile growlers that allow the beer to go flat over time. Home users of this type of growler can re-inject CO2 to maintain the carbonation and keep it fresh. The two-liter standard PET bottle is just a little over ½ gallon growler size (3.628 ozs. bigger). Leaving about 3” inch foam/CO2 space below the threads will accommodate ½ gallon of brew in this oversized two-liter container. This makes the two-liter standard PET bottle the perfect ½ gallon growler. Can I install a tube in the CarbaCap to help carbonate liquids? Quick Answer: It’s not recommended or necessary. Expensive CO2 will be wasted using this method. Using the CarbaCap Instructions is more efficient. Let us consider how CO2 gas is mixed with the liquid when carbonating. Defusing CO2 into liquid for creating a carbonated beverage for home or commercially is covered in multiple articles throughout the internet and can be confusing. Direct diffusion and manual agitation is the superior method for home use. Only when manual agitation is not possible will a factory or brewery use a passive diffusion method. Often in this situation, the liquid is pumped by an inline or stationary diffuser. Some breweries have diffusers built into their bright tanks. Both passive or direct diffusion methods require declining atmospheric pressure in order for it to properly work. In a passive diffusion type system, a diffuser (or tube) injects CO2 near the bottom of a small container. The high pressured gas agitates the liquid with bubbles of CO2. The flow of CO2 continues until the set inbound pressure is reached and the flow stops. The only way for gas to continue to flow into the container is for the container to drop in pressure. This off-gassing (leaking) is necessary to make this type of system work. In a small one liter bottle, that amount of liquid exposed only has an absorption rate of about 20.9 to 24.1%* on passive contact. The remaining gas pressurizes the container and is off-gassed to keep this type of system working. Over time an acceptable carbonation can be achieved with a considerable loss of CO2. On average this loss is about 75.9 to 79.1%*of the total volume of CO2 injected. In a home system, this is lost or wasted. Manufacturers will often recycle this off-gassing CO2. In a direct diffusion type system, the CO2 is injected into the headspace of the container. Small hand-held containers are best mixed by manual agitation (shaking) of the liquid. This exposes more liquid to the injected CO2 and allows 100% absorption/conversion on contact. The small container fitted with a CarbaCap starts at a negative pressure. All of the inbound CO2 gas is exposed to the liquid. After manual agitation, this will drop the pressure and allows additional gas to be injected and absorbed. Repeating this process fully carbonates without the need for off-gassing or losing any CO2. Just following the simple 5 step instructions on the CarbaCap’s retail card will save you a considerable amount of CO2 and money. After all, we don’t sell small expensive proprietary CO2 cylinders. *The viscosity of samples at 45°F liquid temperature, produced a variant of percentages. At what PSI do I set for water carbonation? Quick Answer: Carbonation can be achieved using a 20-30 PSI (or 1.36-2 atmosphere) outbound setting on your CO2 regulator. Carbonation is achieved by getting the liquid to absorb CO2 over time. There are three things that are needed to expedite this process. Pressure must be above 1 Atmosphere (14.6959 PSI) at sea level. Time. Liquids will absorb carbon dioxide (CO2) gas into carbonic acid over time. Carbonation can be achieved using a 20-30 PSI (or 1.36-2 atmosphere) outbound setting on your CO2 regulator. Small injections of carbon dioxide (CO2) into cold liquids over time will work. Manual adjatation or shaking will expose more liquid to the carbon dioxide for quicker absorption and conversion into carbonic acid. Repeating this process over time will build up more carbonic acid in the resulting carbonated liquid. Do not make the mistake of thinking that "more pressure will get you more carbonation". Only one Atmosphere is required to keep the carbonic acid in suspension within the carbonated liquid. More carbonation can only be achieved by getting more carbon dioxide dissolved into carbonic acid. This can be achieved at relatively low pressures. Please refer to our Carbonation article for more technical details. Is the CarbaCap compliant with California Health and Safety Code? Quick Answer: Yes. The CarbaCap unit and its retail packaging are completely compliant with all Health and Safety Codes throughout the USA. The CarbaCap unit is made out of three materials. The CarbaCap body is molded out of “Food Grade” or “Surgical” K-Resin® copolymer. This is the same material used in surgical implants and food containers for the past 40 years. It has been intensely tested by Underwriters Laboratorys (UL) and countless others over time and has never been found to be carcinogenic in any way. The surgical stainless steel pin and spring along with gaskets are also heavily tested and are universally deemed food and surgically safe. The CarbaCap is completely in compliance with California Health and Safety Code - HSC § 25249.5-25249.13 and 2018 amendment ”Proposition 65 Compliant”. In addition to this the CarbaCap is compliant in every regard with all Federal US Safety Codes. You could probably eat or surgically implant the CarbaCap in your body with no carcinogenic effects. We do not recommend this as this would only void your replacement warranty. As the manufacturer of the CarbaCap we also get frequently asked questions from our retailers. [R-1] Why are my new CarbaCap working better than my old ones? Quick Answer: CarbaCap is made of a nonshrinking plastic that holds up better than the older plastic. About one year ago we started working on perfecting the CarbaCap. The CarbaCap is based on old technology, however it needed to be improved. As the manufacturer we were working with a mold that became increasingly unreliable. The proprietary 3M product we were making the CarbaCap from was actually corroding the mold. We went through an extensive refurbishment of the mold and also tested out different types of materials. We quickly discovered that the material we were using was not able to be reliable through the manufacturing process. The old plastic we were making the CarbaCap with had a tendency to shrink when it cooled. This had a tendency to leave ripples in critical areas that would cause it to fail during its manufacturing. There were new space-age plastics that would work better and be far more reliable. For over a year we explored new options for making the best possible product we could. Working with our molding and plastic provider we discovered that a new type of plastic known as K-Resin® would work with our mold and decrease the shrinkage and defects. This made the CarbaCap the correct size and fitted tightly within the injector and on the container. We feel that this will improve the quality of the CarbaCap and will help users maintain a good and tight seal. At first we jokingly we refer to this as Gütentite Technology™. However it's more than just a twist on an old product. This improvement will revolutionize the reliability of carbonating at home or at the industrial level. This new type of plastic should last for many years of reliable use. Even though the CarbaCap is fully warranted for life, this will give even more confidence in the reliability of our products. Sometimes innovations and improvements on old technology can make a big difference. We hope that the CarbaCap with the new Gütentite Technology™ improvements will provide our customers with exceptional, reliable and durable use for many years to come. Other similar products on the market have come and gone with a fad enthusiasm. We are confident that the CarbaCap will be here for many years to come with an ever-growing list of satisfied users from around the world. [R-2] Is the CarbaCap available in multiple unit packaging? Quick Answer: Each CarbaCap is intended for singular users. The instruction card is included with each CarbaCap. Wholesalers custom packaging is available by contract. At this time the CarbaCap is available in single unit retail packaging. Each CarbaCap comes complete with instructions, warranty and usage warnings. It is important that each unit has instructions that the user can refer to easily. Failure to not follow the instructions can cause accidents. Retailers receive the CarbaCap ready for sale out of the shipping container. If you are interested in custom packaging please contact us for more information. [R-3] I'm a retailer/wholesaler that would like to carry your product? Quick Answer: The CarbaCap is a wonderful addition to your catalog of products. Please email Sales@CarbaCap.com us to establish an account. The CarbaCap is only sold in bulk to qualified retailers and wholesalers. At this time we do not sell to the general public. As the manufacturer of this exclusive product you will find our pricing and services at the lowest cost possible. The first step is to establish an account with us. Contacting the CarbaCap offices by email is the most efficient and recommended route. After company qualifying with our sales department you can make purchase orders. We look forward to a long and fruitful relationship with your company.